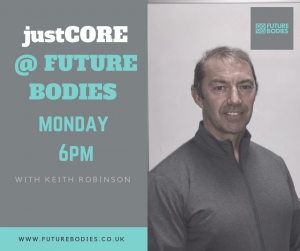 WE ARE HAPPY TO ANNOUNCE FUTURE BODIES WILL HAVE KEITH ROBINSON HOSTING HIS WEEKLY justCORE CLASS ON MONDAYS AT 6PM. Your core muscles, including your abs, back and glutes, provide you with stability, balance and strength, which help to prevent injury. This class is designed to exercise your core muscles, providing the vital ingredient for a stronger, fitter body. Keith Robinson is a great instructor and has a solid reputation, and will definitely put you through your paces! Just CORE is challenging, but great to tone your stomach and improve your shape! It’s simple to BOOK – just give us a call or head over to our FACEBOOK and send us a message. We have various other classes available at Future Bodies, as well as affordable membership. Make 2018 your year to start thinking about your health and fitness and spend some time on your bodies needs.